The Savage North Director’s Cut is available via DriveThru in both pdf and print. If you bought a pdf via DriveThru in the past, just go to your library and redownload it to get this cleaned up version with 26 new pages of content. This is our old school swords and sorcery setting/adventure for OpenQuest broadly compatible with other D100 games. This entry was posted in OpenQuest, Swords and Sorcery by Newt. Bookmark the permalink. 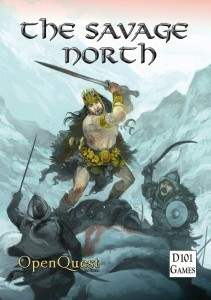 I notice this is no longer up at Drivethrurpg. Is there a problem? I bought this originally thru Lulu and I see it isn’t there anymore. Anyway I do have my original… are the changes big enough that I should worry about getting the “director’s cut”?